Making expressive travel photographs while on tours, cruises, and other forms of travel where large groups of other people are involved can offer both benefits and drawbacks. Our logistics are made easier, we know exactly where we are going to be shooting, and we may often obtain special access to places where we otherwise could not easily go. On the other hand, whenever a bus load of tourists descend upon a given place, our shooting time will necessarily be limited, and we may often miss out on the best light of day. I recently joined nearly 100 other passengers on an eleven-day small ship cruise that took me down the Mississippi River from Memphis, Tennessee to the Gulf of Mexico. The cruise ended in New Orleans, Louisiana, where I spent an additional two days shooting on my own. I made about 5,000 images on this journey and post 68 of them here. In this gallery I hope to demonstrate that it is very possible to make expressive images even when being herded by guides from place to place, room to room, and garden to garden. I will often point out the conditions under which I made my images, and explain what I did in order to make the best out of what often confronted me in terms of photographic conditions. As usual, I offer this gallery in blog style. A large thumbnail is displayed for each image, along with a caption explaining how I intended to express my ideas. If you click on the large thumbnail, you can see the image in full size, as well as leave comments and read the comments of others. I hope you will be able to participate in the dialogue. I welcome your comments, suggestions, ideas, and questions and will be delighted to respond. 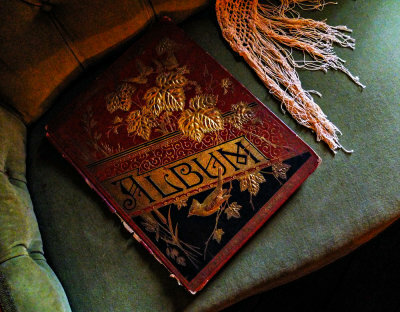 I found this album, also from the Victorian period, lying on a curving couch next to the strands of a shawl. The surroundings were a perfect match for the ornate design of the album itself. The album holds many memories of the ever-changing family that once lived in this home, and I made my own memory of it here. The nearly 200 year-old Oakley Plantation hosted the painter John James Audubon for four months in 1821. Audubon was paid $60 a month, along with his room and board, to tutor the daughter of Oakley’s owners. When he was not teaching, Audubon roamed Oakley’s 100-acre forest, filling his sketchpad with notes and drawings for his famous series of bird illustrations. 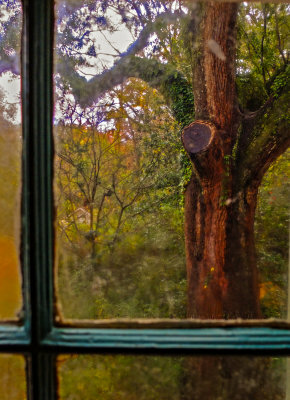 I photographed part of this forest through a steamy windowpane, capturing a scene that Audubon himself might have viewed as he worked in Oakley’s living room with his pupil. Nearly all of the old plantation houses we visited on this journey were filled with massive amounts of Victorian furnishings. However Oakley Plantation was the exception. 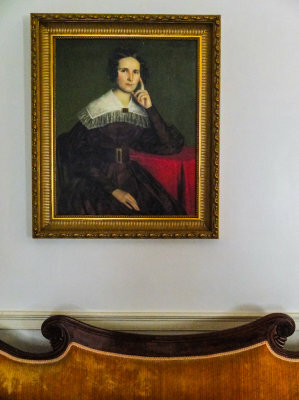 Its rooms have been restored in the style of the late Federal Period (1790-1830), reflecting their appearance when John James Audubon visited the home in 1821. This image captures the understated essence of the place itself. A dignified portrait, placed just off center over an elegant Empire sofa, dominated the room. I chose to include only the top of the sofa, comparing its graceful curve to the rigidity of the rectangular gilded frame enclosing an oil painting of a thoughtful young woman. The geometric relationship of the abstracted sofa and the portrait creates a sense of tension that seems almost hypnotic. Wade Hampton, the largest sugar producer in Louisiana and the largest slaveholder in the South, built Houmas House in the late 1820’s. Thirty years later, this plantation was the largest sugar producer in the United States. I made this image of one of its living rooms by night, lavishly decorated for the Christmas season. I shot through a window, obtaining a perspective that would have been impossible to create from within the house itself. 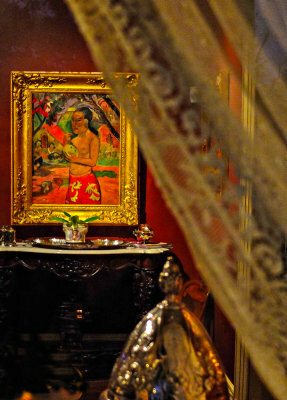 The present owner of Houmas House has installed an art collection that takes visitors by surprise. 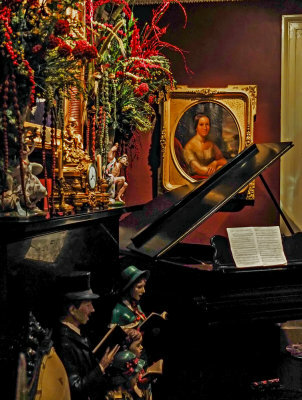 Two of the most notable treasures are placed within inches of each other on a mantle in one of the living rooms. The gilded clock is said to have belonged to the estate of Marie Antoinette, and later purchased by Napoleon. 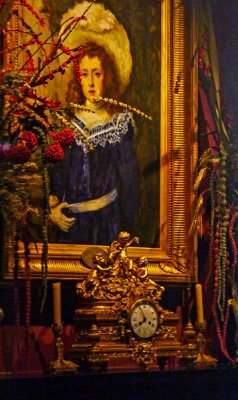 Our guide told us that the painting just behind it is attributed to the French painter Eduard Manet. The woman in the painting is likely Manet’s niece. I bring the two treasures together by framing them in Christmas decorations. By shooting from the side and cropping into the frame itself, I allow the woman in the painting to look at us through the spray of drooping blossoms. One of the most incongruous sights in this old plantation house was small statue of the Confederacy’s opponent, Abraham Lincoln. It is a miniature replica of Gutzon Borglum’s 1911 life sized statue of a “sitting Lincoln” outside the court house in Newark, New Jersey. Borglum, who also used Lincoln as one of the faces on his monumental sculpture at Mount Rushmore, treats Lincoln as very human here, a far cry from the brooding Lincoln of Daniel Chester French that graces the Lincoln Memorial. The Houmas House copy of Borglum’s statue is coated in silver. When I photographed it, it reflected the warmth of the orange lighting within the room. 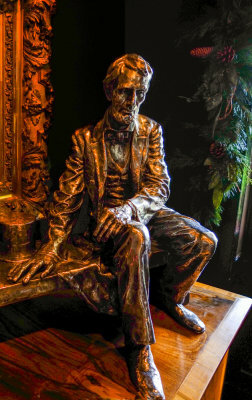 I shot the statue at an angle to make Lincoln seem to be look directly at us, one hand resting on a leg, the other on a bench near his stovepipe hat. Ironically, this Lincoln is visiting a plantation house that once controlled the lives of more than 800 slaves. 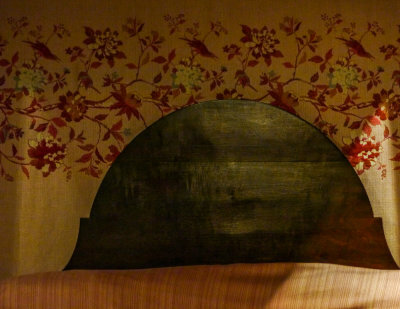 I did a double take as I walked past what I thought looked like a Gaugin painting hanging on a wall in one of the Houmas House rooms. I asked our guide if it really was a Gaugin, and she said it was indeed an original, unsigned painting by the famous French artist. She said the present owner of Houmas House had purchased it an auction in New York. It is said to represent the painter’s Tahitian mistress. I noticed the diagonal lines in the upper right hand corner of the painting, and returned that evening to photograph the painting through a curtained window. The curtain forms a diagonal along the right side of my image, and rhythmically repeats the flow of the diagonals in Gaugin’s painting. 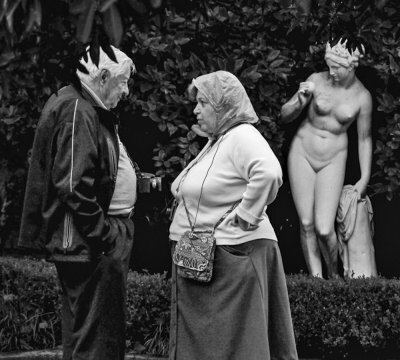 While photographing in the vast gardens at Houmas House, I came upon two members of our tour group conversing under the gaze of this apple-clutching sculpture. The marble statue is most likely a metaphorical interpretation of Eve contemplating her original sin. My fellow travelers seemed to take no notice of Eve. The marble lady pretends to be otherwise involved, but could well be eavesdropping on what appears to be a serious family discussion. At least that’s how I saw it. I converted the image from color to black and white. The original color image featured the lush green environment, which competed with the quiet mood and silent dialogue incongruously playing out in this image. 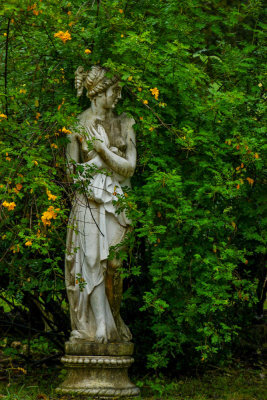 While this begrimed figure may use a drape to modestly cover her otherwise unclothed body, nature goes one better here by overwhelming the sculpted body within a cloak of living green leaves and yellow flowers. The incongruous blend of art and nature offers a double helping of privacy to this well worn 19th century work of classical sculpture. I moved my subject to the left side of my frame, allowing it to gaze into additional cover if needed. 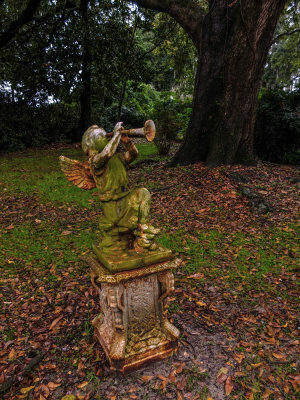 In the farthest corner of the Houmas House Gardens, a rusting metal statue of an angel blowing a horn stands forgotten and forlorn. Orange rust and green moss coats the entire surface of the statue -- nature and time will leave an inevitable mark on metal left outdoors for decades. I made this image as an ironic comment – the statue probably represents Gabriel, an angel that supposedly will blow the trumpet heralding the end of time itself. Yet the colors rendered by the inevitable cycles of time itself are evident throughout the image – the rust, moss, and the carpet of dead orange leaves upon the ground are all measures of nature’s continual toll. I first thought that the rusting angel might have been a grave marker, but I saw no inscription of any kind upon it. The angel is probably simply an ornament of wealth, possibly carried to this farthest corner of the property by the Plantation’s slaves more than 150 years ago. I made this image from the balcony of Oak Alley’s Big House, just as the sun momentarily broke through a heavy overcast. I waited for the three figures to divide the quarter mile long red brick walk into thirds, and made this image. It is one of the most photographed spots in the Old South. Most pictures made from this spot attempt to balance the rows of facing trees evenly. However, instead of making a static centered image of these facing double rows of Virginia Live Oak trees, I reveal mainly the row on the left by placing the sidewalk over on the right side of the frame. This off-center placement gives the image its tension and sense of movement. French settlers planted these trees here 300 years ago. 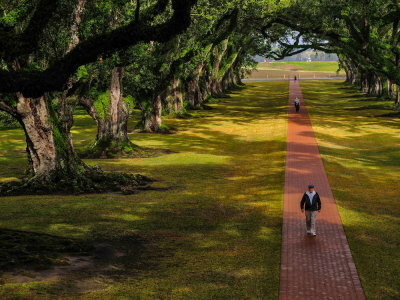 When Oak Alley Plantation first began growing and harvesting sugar in 1839, these trees were already more than 100 years old and fully mature. Since Live Oaks have a lifespan up to 600 years, these trees are still considered to be middle-aged. The green growth on the limbs and trunks of the trees is called Resurrection Fern. This plant appears to shrivel and die when dry, yet manages to uncurl and reopen to a vibrant green when water becomes available. Thanks, Elayne, for taking the time to go through these images three times. The more times that I go through them myself, I find that I tend to discover more and learn more as well. Glad my images gave you a glimpse of what I both saw and felt during this particular journey.